What Is the Wrigley Mansion? William Wrigley, Jr. of chewing gum and Chicago Cubs fame, purchased The Arizona Biltmore hotel during the Depression and had the Wrigley Mansion built nearby as a 50th anniversary gift for his wife. It was used only as a winter retreat for several weeks per year and was one of several homes that they owned. Wrigley Mansion sits atop a hill in Central Phoenix. It has 24 rooms and 12 bathrooms, as well as 11 unique fireplaces. There are 360° valley views from Wrigley Mansion. William Wrigley, Jr. died in the house, just one year after it was built. After William Wrigley's wife passed away in 1958, the Wrigley Mansion underwent several ownership changes. 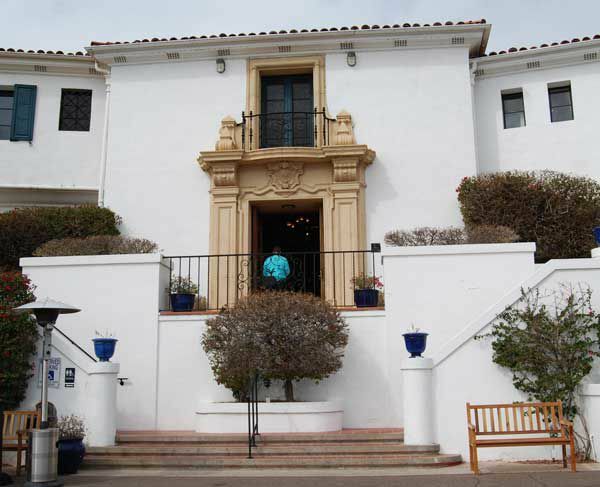 The Mansion became part of the meeting space for the nearby Arizona Biltmore Hotel. Later, Western Savings became the owner, renamed it The Mansion Club and used it as a private club. Western Savings was one of the banks taken over by the RTC during the savings and loan crisis. In order to prevent the mansion from being razed, and to restore it and maintain its historical importance, George ("Geordie") Hormel, of the famous meat company, purchased the mansion in 1992. He renovated it and operated it as a restaurant and lounge as well as a banquet and wedding facility. Although Mr. Hormel passed away in 2006, it is still being operated in that fashion today. It has been designated a Phoenix Point of Pride. The public can tour the Wrigley Mansion. During the guided tour you'll learn about William Wrigley, Jr. and his wife Ada, and the building of the mansion. The tour covers architectural aspects of the mansion as well as introducing you to the people who built it and later saved it. Reservations (602-955-4079) are required for the tours. What Time: There are several tours per day on Tuesdays through Saturdays, one tour on Sunday afternoons (except on holiday brunch days). There are no tours during July, tours usually resume in mid-August. Pricing: You may pay for the tour alone, or reserve one of the Tour/Lunch combination packages. Typically, the maximum number of people for a tour is 25. While walk-ins are accepted as space allows, it is best to make a reservation, even if it is the day before you intend to go. If you have a group, reservations are required. The guided tour of the Wrigley Mansion in Phoenix, Arizona will especially appeal to those people who are interested in historic properties. There's a special reason why this mansion has been maintained in its original form with original contents intact -- you'll learn about that on the tour. If you tend to be more interested in people than homes, the story of William Wrigley, Jr.'s entrepreneurship and subsequent success is a highlight of the tour. Did you know that he actually owned Catalina Island in California? You'll learn more about that, and how that relates to this Arizona home. The Wrigley Mansion sits on top of a fairly steep hill. If you don't want to walk up from self-parking, use valet parking (there is a charge). The tour lasts about 45 minutes to an hour, maybe a bit longer depending on how many questions participants have. Bring cash to tip the tour guide. Between $2 and $5 per person is appropriate. On the tour I attended, there were about 25 people. That's a pretty good-sized crowd. Most of the people on the tour were probably over 50 years old. Winter visitors from Chicago might have a special interest in the tour. This isn't a tour for children; there are no activities for them and it involves mostly lecture. During the first part of the tour, you'll be seated while you listen to the story of William Wrigley, Jr. and how he became a wealthy businessman. After the first 15 or 20 minutes, your tour guide will take you around to various points of interest inside the home including the rotunda, the living room, the dining area and the bedroom. The entire tour takes place indoors, so it is an option even on warmer days. If you want to stop for lunch before or after your tour, your best bet is to call ahead and ask for a tour + lunch package. You may take pictures inside the mansion. The tour guide will advise you of any restrictions on photos. For instance, when I took the tour the photograph hanging in the hallway of the current mansion owner (Jamie Hormel) was not allowed to be photographed. The Wrigley Mansion is located in Central Phoenix, not far from the Arizona Biltmore Resort & Spa. It can be tricky to find the entrance if you are using GPS. The name of the street "Telawa" is pronounced, tell-ah-wah. From the north: Take Loop 101 east/south towards Phoenix. Exit at Piestewa Peak Parkway (SR51) South. Exit at Glendale Avenue and turn left (east) to 24th Street. Glendale Avenue becomes Lincoln Drive. Turn right (south) on 24th Street. Turn left at Biltmore Circle. Take the second right turn into the National Bank of Arizona parking lot. There is a sign there for the Wrigley Mansion. Continue past the bank and over the canal bridge. From the South: Take US 60 (Superstition Freeway) west to the Loop 101 (Price Freeway), then Loop 101 north to SR51. Take Highland Avenue exit. Turn right (east) on Highland Avenue to 24th Street. Turn left and drive north on 24th Street to Biltmore Circle. Turn right (east) at Biltmore Circle. Take the second right turn into the National Bank of Arizona parking lot. Continue past the bank and over the bridge.